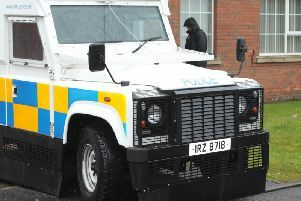 A 34-year-old man was jailed for a total of five months last Friday at Craigavon Magistrates Court. Stephen Magee, no fixed abode, was sentenced to five months in prison for receiving stolen goods, namely a Playstation console and three bottles of perfume, on June 28 this year. A concurrent three month sentence was imposed for possession of a class C drug, diazepam, on the same date. The court heard that on June 28 police received a report of a burglary in Pinebank, Craigavon, and were provided with a description they went to the Simon Community in Portadown. On searching the defendant’s room the items were found along with a number of tablets. He denied being involved with the burglary.